In a small bowl, cover the raisins with warm water and let stand until plumped, about 10 minutes; drain well. Meanwhile, in a medium skillet, toast the pine nuts over moderate heat, tossing, until lightly browned, about 5 minutes. Transfer to a plate. In a large saucepan, bring 1/2 cup of water to a boil. Add half the spinach in large handfuls, letting each batch wilt slightly before adding more. Cook over moderately high heat, stirring, until just wilted, about 5 minutes. Transfer to a colander to drain. Repeat with another 1/2 cup of water and the remaining spinach. In the large saucepan, heat the olive oil until shimmering. Add the garlic and cook over moderately high heat, stirring, until fragrant and lightly browned, about 3 minutes. 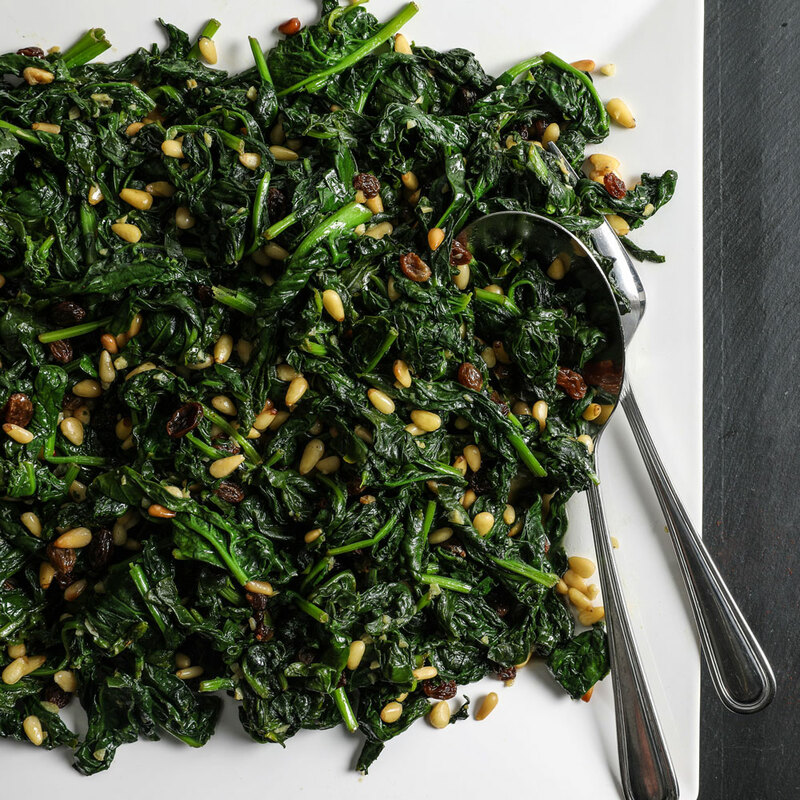 Stir in the spinach, raisins, pine nuts and a generous pinch of salt. Cook, stirring occasionally, until the spinach is hot, about 5 minutes. Season with salt and pepper and serve.